Every cook needs a ‘simple but impressive’ pudding in their repertoire and, luckily, this New Zealand classic is exactly that. You can make it in advance and put the ingredients together at the last moment. Using a very clean bowl, whisk the egg whites with a hand-mixer or stand-mixer. When they start to form soft peaks, slowly add half the caster sugar, whisking continuously. As the mixture starts to look glossier, mix in the rest of the sugar, adding the corn flour and then the vinegar. You should end up with a stiff meringue mix that holds its shape. Set aside 2 tablespoons of the meringue mixture in a separate bowl and gently fold in a few drops of food colouring. Bake in a very cool oven (130 °C) for 1 hour and 30 minutes or until it is dry to the touch but not brown. Turn the oven off, open the door slightly, and leave the meringue inside for a further 20 minutes to thoroughly dry out. Just before serving, whip the cream with the vanilla extract and spread it over the meringue. Finally, top with chopped kiwifruit, raspberries and pistachios. According to ancient folklore, there’s a pot of gold to be found at the end of every rainbow. Sounds too good to be true? 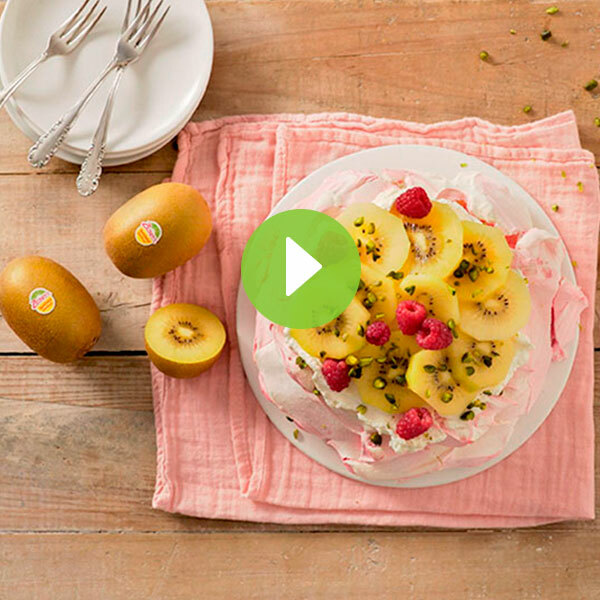 Well at Zespri we’ve got something even better: a delicious yellow kiwifruit with a full spectrum of flavours.